Universal iPad Tablet Tripod Mount safely and securely mount your smartphone, iPad, Nexus and more with a standard thread. Perfectly calibrated to snugly fit without damaging your tablet. Products Feature 1. 2.5- 10.5 inch adjustable size, fits most 3- 14 inch best-selling tablets and Cell Phone - including Apple iPad all models, Samsung Galaxy Tab, iPhone all models, etc. 2. You can hold your tablet by portrait & landscape orientation according the size of your tablet. 3. You can take photo and video or record meeting etc. 4. Easy to install and take it out. 5. Easy adjustable width, with easy and secure lock. 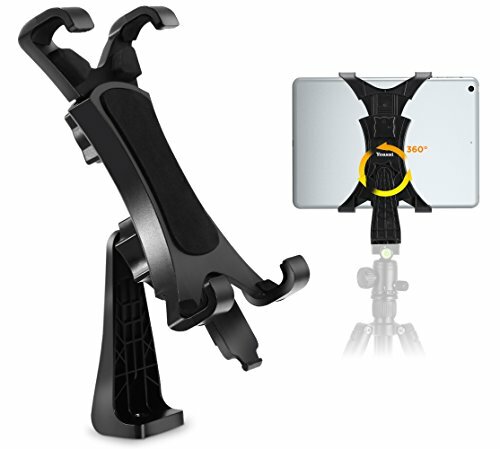 Package content: 1 x iPad Tripod Mount Warranty. Return ship your product within 60 days for a full refund or replacement if you're not satisfied. 12 month warranty. 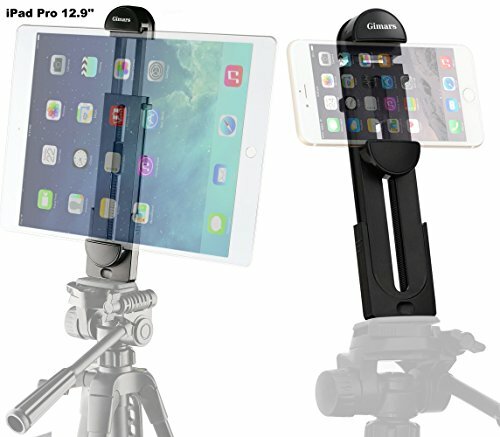 Ulanzi Universal iPad Tablet Tripod Mount safely and securely mount your smartphone, iPad, Nexus and more with a standard thread. Perfectly calibrated to snugly fit without damaging your tablet. Products Feature 1. 2.5- 10.5 inch adjustable size, fits most 3- 14 inch best-selling tablets and Cell Phone - including Apple iPad all models, Samsung Galaxy Tab, iPhone all models, etc. 2. You can hold your tablet by portrait & landscape orientation according the size of your tablet. 3. You can take photo and video or record meeting etc. 4. Easy to install and take it out. 5. Easy adjustable width, with easy and secure lock. 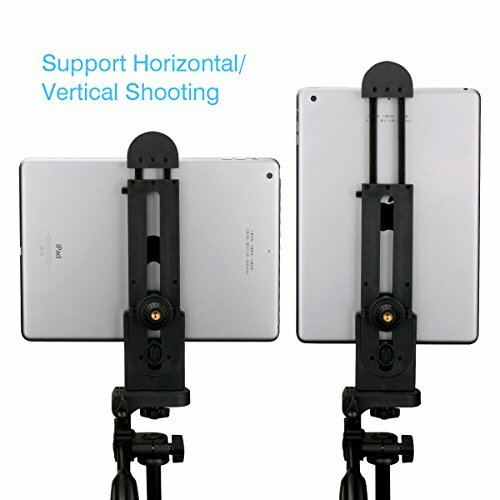 Package content: 1 x iPad Tripod Mount If You need a Metal Tablet Tripod Mount ,We suggest you Ulanzi U-Pad Pro. 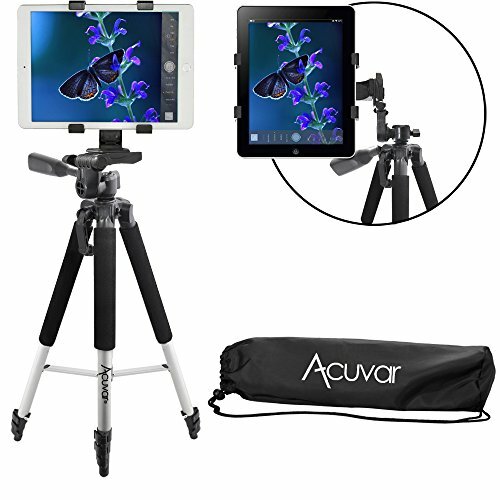 Acuvar Pro Series 57" Inch Tripod ✓ non-slip feet and a bubble level indicator. ✓ adjustable center pole and comes with a water resistant carrying case. ✓ lightweight and mobile with its aluminum alloy legs and a 3-way pan head. 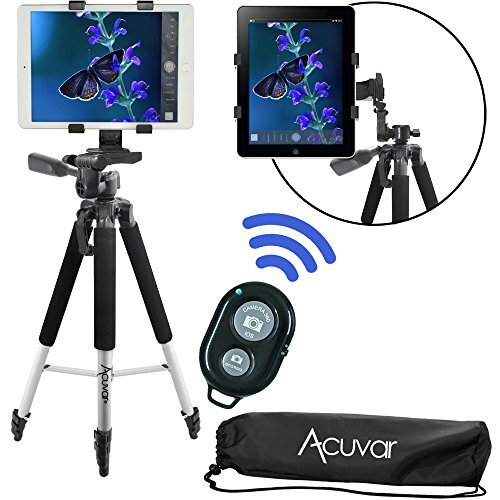 Acuvar Tablet Tripod Mount (Universal) ✓ Universal tripod mount securely screws into all tripods and monopods. 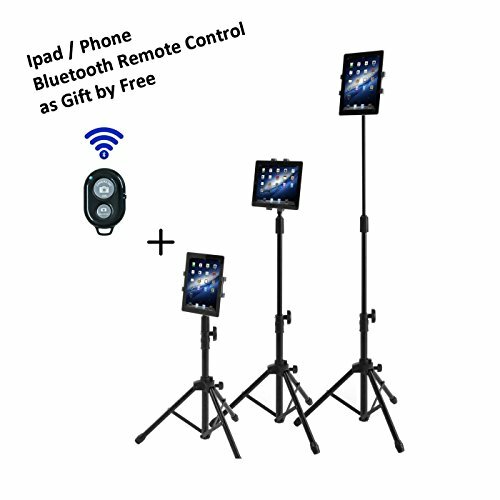 ✓ Adapter is fully adjustable & fits any tablet & large phone with 5.5" to 9.7" inch screens ✓ Perferct for most tablets, including all Apple iPad models (except iPad Pro 12" ): Great for iPad 2, iPad 3, iPad 4, iPad Air, iPad Air 2, iPad 2017, iPad pro 9.7", iPad Mini & all Samsung Galaxy Tab models, etc ✓ Great for Phablets (large phones): iPhone 6 Plus/6s Plus, Galaxy Note 4, Note 5, Note 6, that has a minimum screen size of 5.5" inches or a device width of at least 3" inches. ✓ 7 foam pads keep your device snug and protected. ✓ Easy installation. Easy lock. Snug fit for your tablet. 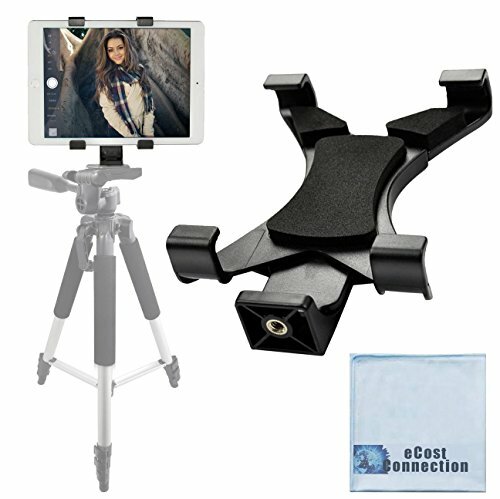 Adjustable width: 12.5-20 cm This cradle allows to mount your tablet or some phablets to any tripod stand or selfie stick with standard 1/4"-20 thread. 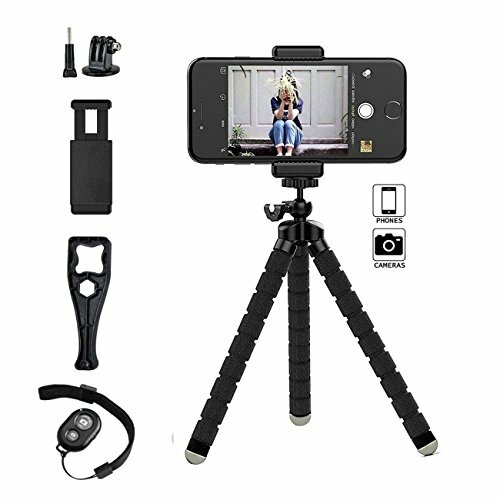 It is extremely easy to use and super effective for keeping your phone in place when taking photographs or recording videos. You can use it vertically and horizontally as well. Simply place your phone inside the tripod adapter, affix it to a tripod and you're good to go. 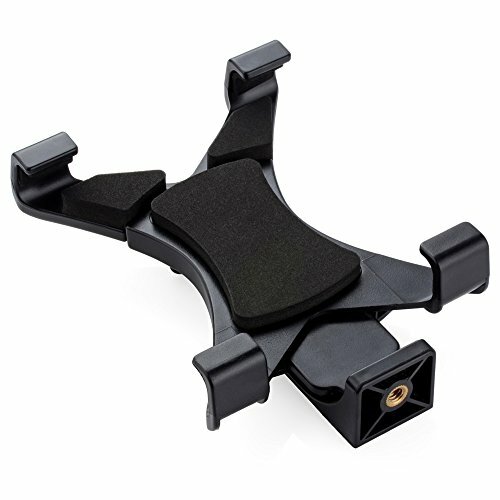 Package included: 1 x Vastar Tripod Adapter Warranty: 18-month warranty. Any questions you have, please don't hesitate to contact us. We will get you back within 24hours. 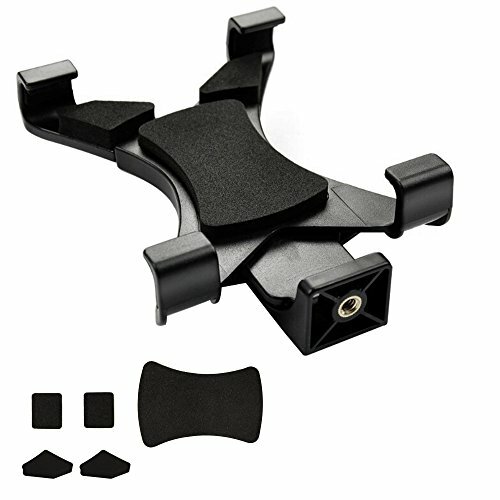 Compare prices on Ipod Tripod Mount at ShoppinGent.com – use promo codes and coupons for best offers and deals. Start smart buying with ShoppinGent.com right now and choose your golden price on every purchase.